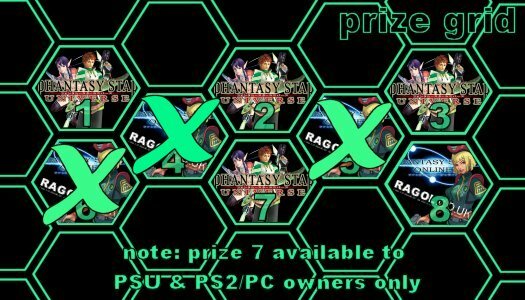 There's 8 great prizes available, 4 Phantasy Star Universe related prizes and 4 Phantasy Star Online/Ragol.co.uk related prizes. If you're a winner, pick a number and whatever's behind the number on the grid, you win! This has surpased my expectatives, 8 competitions hein, now that's a competition for sure. I donate the prize to Mirinee, sended in a PM the info. Your prize was shipped out today so you should recieve them soon. What a nice guy that K_I_R_E_E_K is! Hmm i think i pick number 6! Hope its a good one! Congratulations Liu Bei! You've won a Ragol.co.uk Phantasy Star Online Dog Tag (With Neck Chain)! Please can you PM me your full name & postal address (With postcode) so i can send your prize to you a.s.a.p! Also pink still has 2 prizes to claim! But has yet to make her claim so far, so if you're out there, just so you know! Ohhh dogs tag! Thats cool! Senting the info in PM now! I can't wait for those dog tag!